Stock up on cannon fodder and credits at the same time. Another game bundle has appeared, and this time it's quick 'n dirty. Or, at least quick. The Quickfire Indie Bundle from BundleStars features over half a dozen Steam-redeemable games for a small minimum price. It even includes credit for the co-op game Warframe as well as a copy of Cannon Fodder 3. 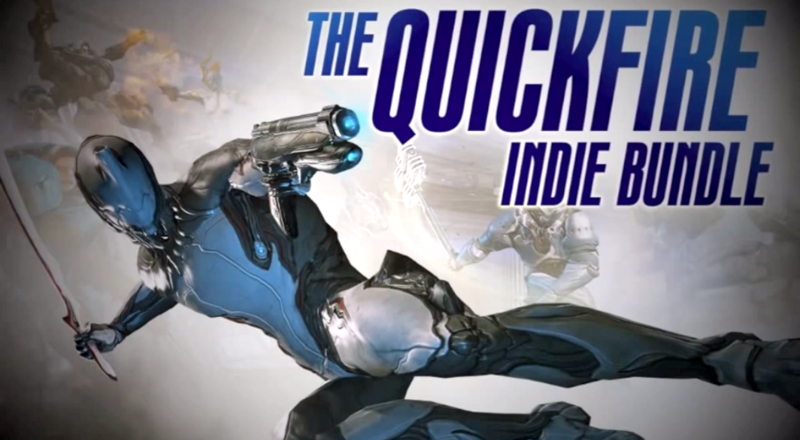 The Quickfire Indie Bundle dumps the pay what you want model in favor of a simple price that supports both indie developers and the Special Effect charity. Several single player games make up the bulk of the bundle, including Guardians of Graxia, Septerra Core, Space Pirates and Zombies, and Dark Sector. Co-op games include Cannon Fodder 3, a tactical action game that supports four players online, and Warframe, which is a bit of a special case. Instead of getting a copy of the third person shooter, you get $10 worth of in-game credit to redeem (170 platinum). Kind of makes since seeing as how the game is free to download and all. At the time of writing there's just over six days left in the Quickfire Bundle, so if you need that space ninja platinum, you'd better get to gettin'. All games are redeemable/giftable through Steam and available for Windows.